Microsoft has endured a lot of flack over the past few years because of the various failures of Vista. At the same time, however, one of its operating systems has been quietly scooping up a lot of praise, thanks to its seamless interface, speed of interaction and general suitability for purpose. 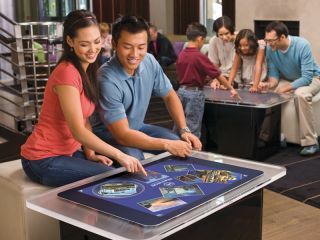 The product line in question is Surface, the multitouch hospitality system that is probably installed on a coffee table-sized PC in a hotel or airport near you. A typical Surface system is a clever array of rear projected screen and sub-surface cameras for tracking gestures, while the software is a derivative of Windows. The projects branched at some time in the past, but there's rumblings that they may be merged again at some point soon. Windows 7 already natively supports multitouch, and recently we've seen multitouch laptops from Dell and HP running Vista. To get a feel for the kinds of thing Microsoft is hoping ambitious developers will do with Windows 7 and multitouch, PC Plus magazine was invited to Microsoft's Reading campus, where an HP IQ850 TouchSmart was kitted out with Windows 7 and some converted Surface apps to show how the two projects will come together. First off, if you've got a PC screen that supports multitouch, there are some things in Windows 7 that are already working well, although driver support for the screens is occasionally flaky. Gestures are up and running in Internet Explorer 8, so you can move backwards and forwards through the page history just by swiping the screen. Pinch zooming is fast too. Then there's Windows Live Photo Gallery, which has gesture support for rotating and zooming images. Cropping an area just makes sense when you do it with your fingertips. The Surface apps may not make the leap to your PC directly, but they do a great job of demonstrating what Windows 7 could become. Collage, a photo manipulation tool that gives you complete control over the placement, rotation and scale of a set of images, has been repeatedly shown in Surface demos and translates well to the small screen. Surface Globe, meanwhile, is a completely gesture controlled version of Microsoft Earth. As well as being able to control the camera angle and zoom as you spin your way from location to location, it pulls in relevant information from the web to highlight points of interest. Using it, we're reminded of the demo from January's CES in which Steve Ballmer showed a vision of the future where our documents and images are populated with layered information pulled from websites, email databases, IM messages and academic resources, all made relevant by search algorithms. It genuinely feels like Surface Globe is nine tenths of the way to fulilling this vision. All the app needs to get the rest of the way is a couple of good plug-ins to make it customisable, allowing users to create personalised maps to lag up friends' houses, places of work, the local hairdresser or previous and future holiday destinations. What we've seen so far has been very much proof of concept, but it's not just PC vendors who are working with Microsoft on reining their multitouch interfaces. At least one major retailer, we're told, is close to co-launching a mini-system using barcode scanning and multitouch for online grocery shopping. The best thing about the different demos that we've seen, though, is that they don't feel gimmicky, like most of the current touchscreen desktop apps around at the moment. Each adds a level of interaction that's simply not possible with a keyboard or mouse – and together they strongly imply that Windows 7 could bring multitouch out of its shell and finally make it live up to its potential.